Pringles chips, sold in stores since 1968, are essentially made from dried potato flakes then shaped, stacked and stored in an airtight canister, which keeps the chips or "crisps" fresh. It takes three to four processed potatoes to pack a Pringles can. If you have ever wondered how many crisps are in a canister, the answer is as difficult to come by as knowing how many potato chips are in a bag. Pringles are sold by weight, so the number of crisps can vary from can to can. One serving of Pringles is 1 oz. or 28 g equivalent to approximately 16 crisps. Varieties include Original Flavors, Multigrain, Xtreme, Family Faves, Restaurant Cravers, Reduced Fat, Light and 100-Calorie. One serving of Original Pringles, all flavors, has 150 calories, 9 g fat -- 2.5 g of saturated fat, no cholesterol and 150 to 220 mg sodium. All flavors of Multigrain Pringles have 140 calories, 8 g fat -- 2 g saturated fat and between 150 to 190 mg sodium. Xtreme Pringles have 150 calories, 9 g fat -- 2.5 g of saturated fat and 110 to 280 mg of sodium. All flavors of Reduced Fat Pringles have 130 calories, 7 g fat -- 2 g saturated fat and 135 mg sodium. Fat-Free Pringles have 70 calories, no fat and 160 to 190 mg sodium per serving. One serving of Original Pringles has 15 g total carbohydrates, 1 g dietary fiber and 0 to 1 g. All flavors of Multigrain Pringles have 16 g total carbohydrates, 1 g dietary fiber and 1 g sugars. Xtreme Pringles have 15 g total carbohydrates, 1 g dietary fiber and 0 to 2 g sugars. All flavors of Reduced Fat Pringles have 17 g total carbohydrates, 1 g dietary fiber and 1 g sugars. Light Fat Free Pringles have 15 g total carbohydrates, 1 g dietary fiber and 1 g sugars. One serving of Original, Multigrain, Xtreme and Reduced Fat Pringles each has 1 g protein per serving. Light Fat Free Pringles have 1 to 2 g protein per serving. Original Pringles are dried potatoes made with one or more of corn oil, cottonseed oil, soybean oil or sunflower oil, rice flour, wheat starch, maltodextrin, salt and dextrose. 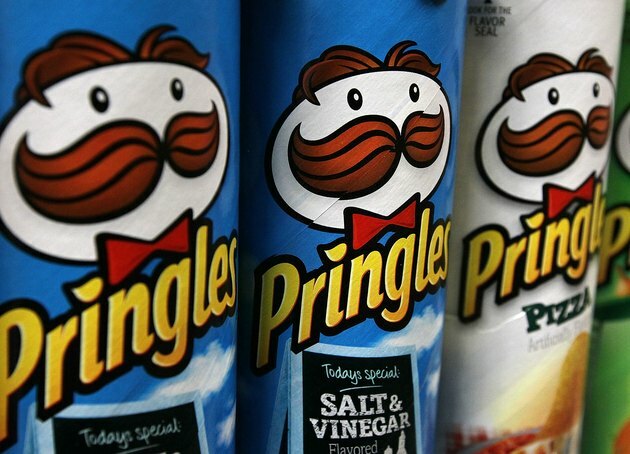 Flavored Pringles such as Sour Cream and Onion, BBQ, Ranch, Pizza and others may contain additional natural and artificial flavors, colors and ingredients. Pringles crisps also contain wheat and milk ingredients, which are known allergens.